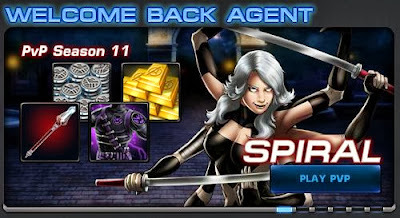 ooh neato: Marvel Avengers Alliance: PVP Season 11 Launches! Patch Notes! Marvel Avengers Alliance: PVP Season 11 Launches! Patch Notes! The 11th Season of PVP has launched for Marvel Avengers Alliance with Spiral up for grabs this time around if you manage to hit Adamantium League by the season's end. Along with the new season, Magnetic Boxes are on sale in case you haven't gotten Magneto yet. They're doing away with them after the sale (but I'm sure they'll bring it back for future sales) as the "Lockbox" tab is beginning to look quite crowded. Five heroes got an overhaul with this patch and look to be slightly to significantly better. They are: Cable, Deadpool, Gambit, Rogue, and Spider Woman.